Replacing the roof of your home is a time consuming task and its price isn’t one you should ignore. If your old roof was destroyed by the wind, has rotten or has become unreliable due to its age, you should think about changing it. This article will give you a good idea about the final price you should expect. Even if you’re in a hurry to change your roof, don’t do it blindly without asking roof dealers for a final price first, along with a break down of the expenses, to understand exactly how much you’re spending and on what types of materials. In the same note, don’t hire the first roof contractor you find. Talk to multiple contractors, ask about skills, professionalism, finished projects and costs you should expect for a house like yours, then hire the one that will give you the best quality for a price you’re able to pay. It’s almost impossible to replace the roof yourself, if you don’t have the necessary skills, tools and materials. 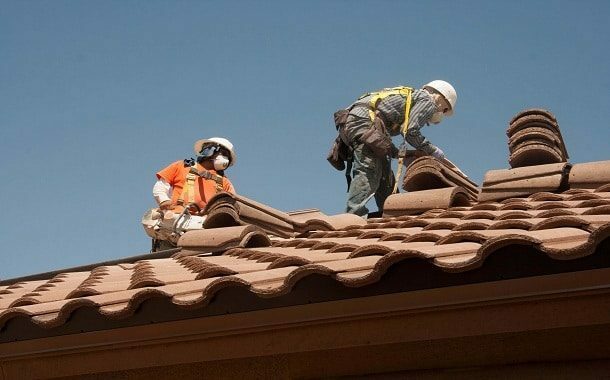 Some minor mistakes might reduce the lifespan of your roof considerably, so it’s best to hire a professional, seeing that this is something you’ll only have to deal with once every few years. If you need to get a roof of about 2,000 to 2,600 square feet, expect to pay a final cost of anywhere from $1,100 to $10,000. This will include materials and labor expenses. You will most likely be charged based on the size of your roof, calculated in square feet. If you don’t know how to calculate an area in square feet, ask a professional, but as a guideline, a square of 10×10 feet makes 100 square feet. If you want to cut down on expenses, a great tip is to get rid of the old roof yourself, or with the help of a few friends, so that you won’t get charged for this by the roof contractor. If you decide to do this yourself, take down the old roof with care, because anything you mess up or break will probably need to be fixed and will add up to the final cost. If you don’t want to do it yourself, you need to know that if you have a one-story roof made of a single layer, most professional roofers will charge you around $100 – $150 to remove it. You’ll pay $130 – $180 to remove a double layer roof, $150 – $200 to remove a triple layer one, and the price goes up with more complex types of roofs. The cost will also increase depending on the steepness and height of your roof. After the old roof is removed, you’ll be charged for the installation of a new one. Among the most common and used types of roofs there are metal, asphalt roofs, clay tiles and slates. You will spend around $140 – $160 per 100 square ft on a single layer of asphalt roof installation. A metal roof will be a lot more expensive, anywhere from $400 to $1,200 per 100 square ft. If your old roof isn’t badly damaged, it may only require some minor repairs. In this case, you can use rubbers and synthetic membranes to protect your roof from water or ice damage, reducing your expenses to $50 or even less. If you don’t want to change your roof monthly, then it’s best to get a skilled, professional and reliable roofer. He must have skills in local building codes and should be able to determine the number of layers you’ll need before starting the job. He should also be able to offer you a guarantee on the quality of his services. Should the average working Joe change his damaged roof? The cost of a new roof may be as much as $10,000 once you decide to hire a professional roofer, if you opt for expensive materials. But this shouldn’t hold you back from changing a damaged roof. Not changing it might cause leaks of water that could damage your furniture and electronics, or worse, infiltrate in walls and cause them to lose their strength. Seeing that this is an operation that will usually last for years, the price is often worth it. https://www.thepricer.org/wp-content/uploads/2016/04/new-roof-price.jpg 380 610 qSign http://www.thepricer.org/wp-content/uploads/2016/11/pricerlogonew.png qSign2016-04-28 02:00:112016-04-28 02:00:11How Expensive Is a New Roof? How Much Does a Will Cost? How Much Does a Fire Extinguisher Ball Cost?